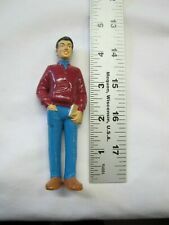 Older Pastor Teacher Male Figure Doll House People Pretend Professionals 5"
Perfect as a doll house doll or for stand alone play. Man is approx. These are nicely detailed. They stand easily on their own. Great positive image discussion starter for children, explaining that everyone in our community is important and has value. Computer Repairman Vinyl Figure Doll House People Pretend Professionals 5"
New in original plastic bag. These are nicely detailed and carefully painted. Once out of the bag, they stand easily on their own. Construction Worker Vinyl Figure Doll House People Pretend Professionals 5"
Perfect as a doll house doll or for stand alone play. These are nicely detailed and carefully painted. They stand easily on their own. 4.25" Tall. Joints don't bend. 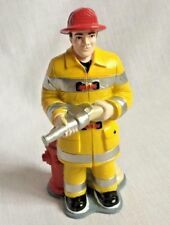 Fireman Fire Fighter Vinyl Figure Doll House People Pretend Professionals 5"
It is jointed to be poseable ~ his positions make him look like he is really juggling! It may have slight wear due to being pre-owned. Dollys Gallery. Dollhouse Miniature Doll King Alfred. by Safari Ltd. Doll is made of Plastic. This is a super-tiny man doll for a dollhouse! He is just over 3/4" tall. We don't mind checking to see if it is right. We will make it right! The dollhouse item were made in the USA! Lot of 5 doll house size dolls including. Maker: Made in USA. Marked Renwal /NO. 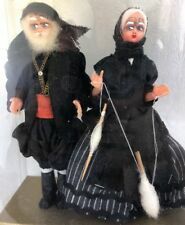 42 or U.S.A. /N, the other doll's maker's are unknown. He is multi-jointed at shoulders, waist and upper legs. His features and clothes are unpainted molded tan plastic. FAIR SKIN, REDHEAD HAIR, BLUE EYES. DOLLHOUSE DOLL. Also, the shoe on his right foot has a hole in it and his toe is visible. A bit of black paint or black nail polish would probably keep it from being so visible. United Kingdom. Rest of World. Characteristics Single Item. Manufacturer: Aztec Imports Inc. Parental supervision is strongly advised. EAN 0717425900289. New without previous use, but transparent plastic was released and reinforced with pins. size : 15 cm. These were made by Marx but have no markings to identify. One mans jacket is a faux suede and the other has his shirt on the front but it’s missing on the back. One woman is missing her arms. Plastic shoes, heads, and hands.